1/4" is the preferred thickness. 3/8" or 1/2"can be used for effect but make sure that the furniture can carry the weight. 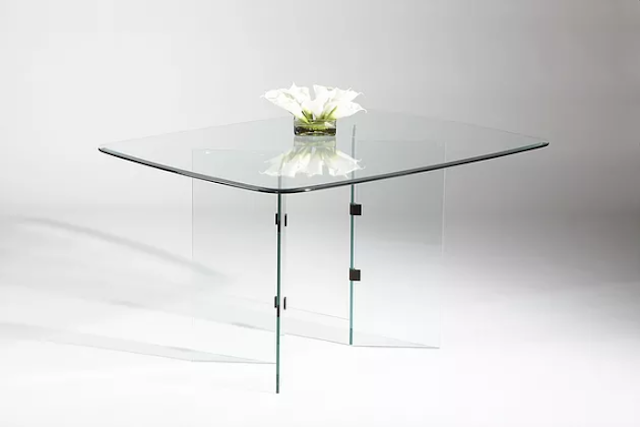 Annealed glass is sufficient to protect the table but glass can always be tempered for added safety, especially if there are younger kids in the house. Glass table tops can also be used in situations where the entire surface is made out of glass The legs can also be made of glass, wood, metal, or any other material. In these instances, the glass has to be tempered for safety reasons. Thickness should be at least 3/8" and edges have to be flat polished and possibly beveled, depending on preference. Recommended glass thickness: 3/8" or 1/2" thinner glass is not recommended in these cases. flat polish, pencil polish, or beveled polish. This is an option where you are in complete control and you can choose the look and the effects you want for your glass furniture. Tempered glass is recommended for added safety and strength.